Mosob may just be my new favourite place ever. It has everything a restaurant should: good food, good service, community feel, warmth, convenience, value – everything. I had heard of this restaurant through my friend Tim‘s review on Qype. Not being far from my house, I knew I had to try it. 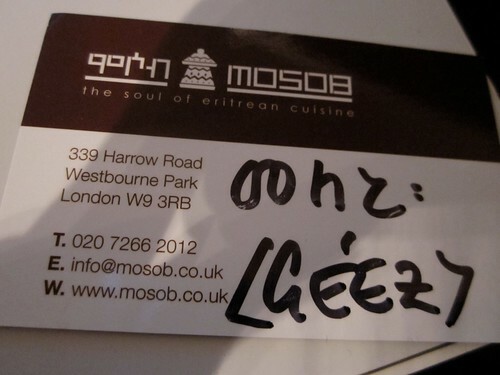 Mosob specialises in Eritrean cuisine. The owner, whose name we learned was Benjamin (anglicised, of course) came over from Eritrea to Maida Vale 21 years ago. His mother set up Mosob, and it’s been the family business and community mainstay since. Benjamin is immediately likeable. 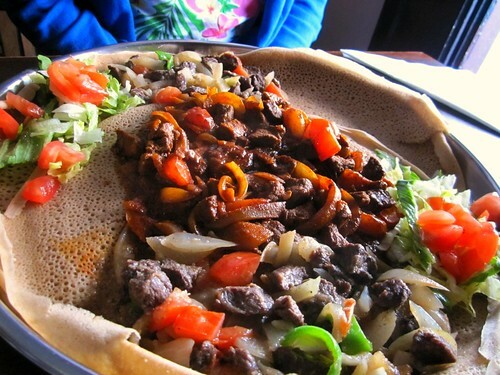 He casually asked if we’d had Eritrean food before, ready to give his spiel on how they don’t use cutlery – instead using Injera, a porous pancake-like bread to sop up the rich stews and sauces. I said that I’d had Ethiopian before, but understood it to be different. He explained the differences (though to me, it still sounded the same), and like clockwork produced a book on Eritrea’s capital, Asmara. We ordered our starters and mains. In the meantime, we chatted with Benjamin about the neighbourhood and how things have changed over the years. Having been around for over two decades, he was an encyclopedia of knowledge. From the former crack-den across the street to the street-to-street differences in wealth, Benjamin knew all. It’s not every day you get a history lesson with your meal. Our mains arrived before our starters. Ooops. It was the only snafu. The food was so good and filling that we really didn’t mind. Benjamin ordered starters anyway and wrapped them up for us to take home free of charge with massive apologies. That went a long way. Both were tasty, but I preferred the rich spiciness of the lamb to the beef. 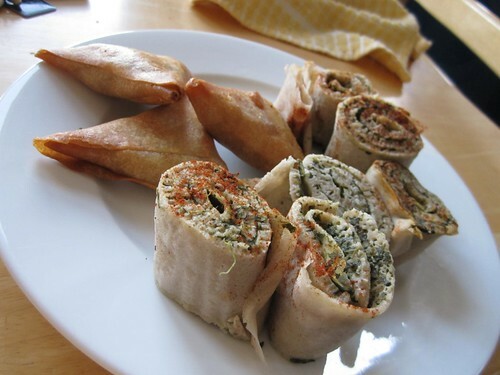 For starters, which we had promptly upon our return home, we had the Spinach Rolls – Spinach with traditional herbs rolled in injera and garnished with olive oil & chilli; and the Meat Sambosa – Pastry filled with mildly spiced lamb. I was glad we were able to have these later. The Spinach Rolls in addition to all the Injera we had with the meal would have been too much bread. They were, however, delicious after our stomachs had settled a bit. The sambosas were pretty much a samosa, but with heavier emphasis on cumin. Also lovely. All in all (with our free starters), a glass of wine, beer and service, the bill was an incredibly reasonable £25. At the end of the meal, Benjamin gave us cards with our names written out in Eritrean (a half phonetic language, we learned) and invited us to a community event he puts on every year. The whole place made me feel all warm and fuzzy, so much so that I’ve told only about 20 people how good it is and how – even for people in East London – it’s worth the trip. Now, who wants to go back with me?